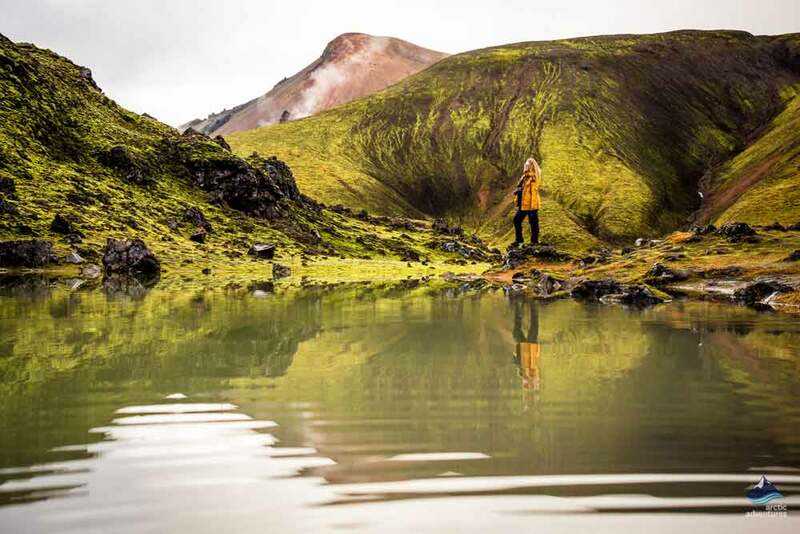 Landmannalaugar is a unique bubbling geothermal wonderland with caramel color peaks, soothing hot springs, rambling lava flows and clear blue lakes. 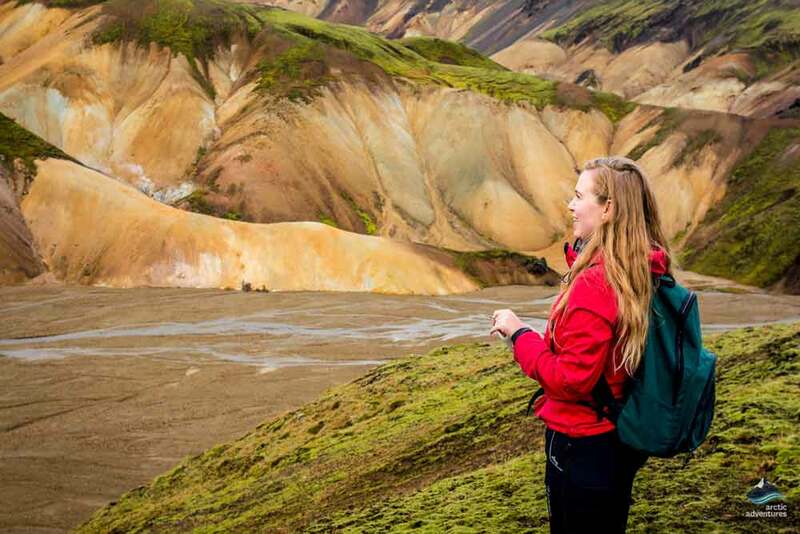 Landmannalaugar is home to Lagahraun lava fields, Mount Brennisteinsalda and Bláhnjúkur, forming a beautiful and colorful setting for our hiking tour. 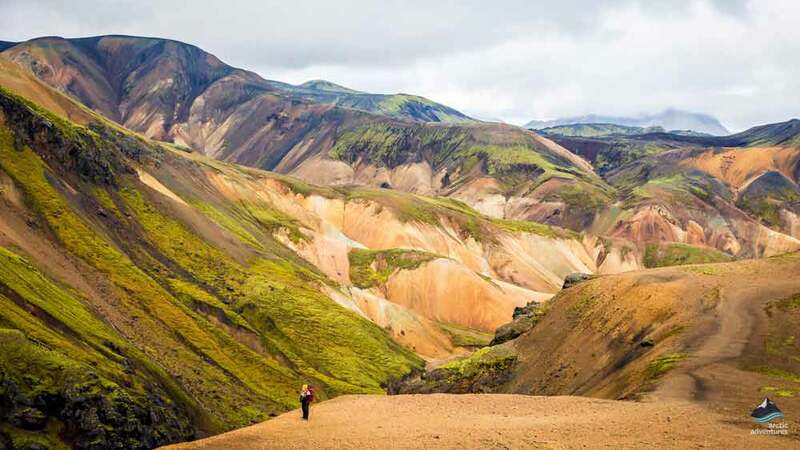 Landmannalaugar is located in a place called Fjallabak Reserve in the remote highlands of Iceland, here you can find some of the most stunning hiking trails in the country as well as being the starting point for the famous Laugavegur trail. We end our day of hiking with a nice soak in the natural hot pool. 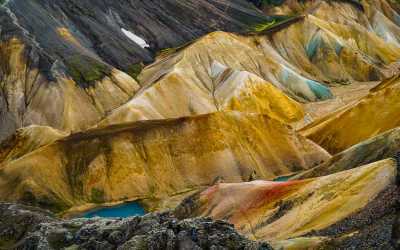 Landmannalaugar is located in a place called Fjallabak Nature Reserve in the Icelandic Highlands. 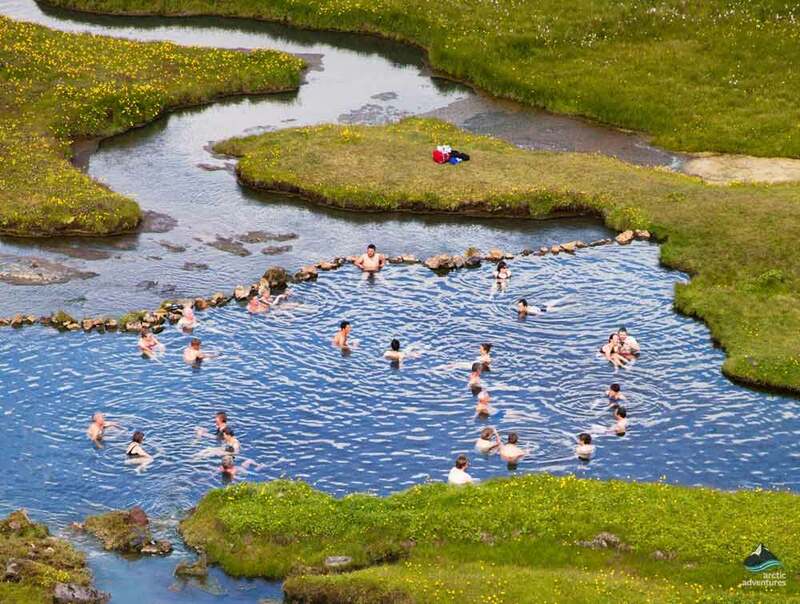 Landmannalaugar is geothermally active, a fact that is displayed with incredibly colorful mountains, steam rising from the ground, and of course the natural hot pool that is popular for bathing. 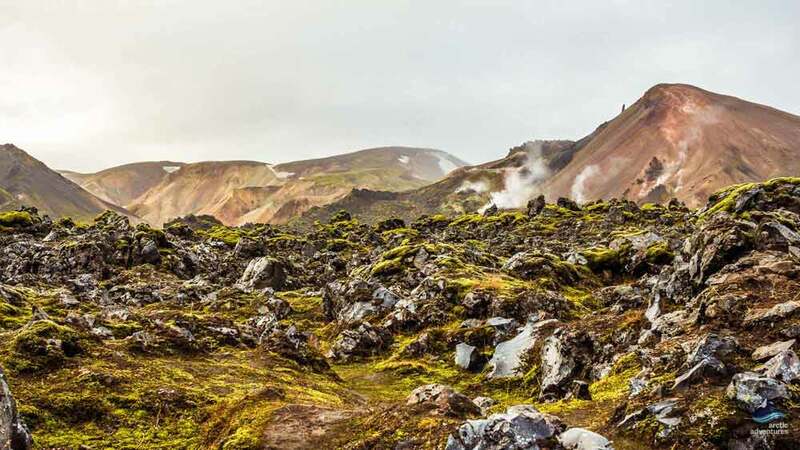 The landscapes are extremely diverse ranging from the black lava of Lagahraun lava field, Mt. Brennisteinsalda multicolored by sulphur, steaming hot springs, green moss and red iron. In front of Brennisteinsalda, we find a field of obsidian and nearby Bláhnúkur volcano, with black and blue sides. All of this and much more create a unique color flow that is almost painting-like. 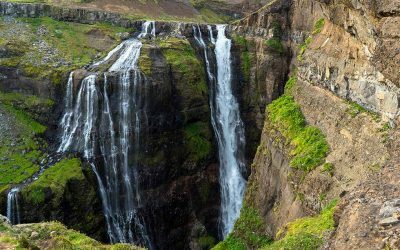 A wonderful setting for a great day hike in Iceland. This secluded area has been a favorite among adventure seekers for years and now you have the chance to visit this magnificent place. 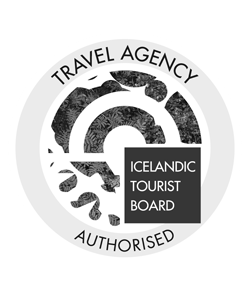 The tour is available with or without pick up from Reykjavík. 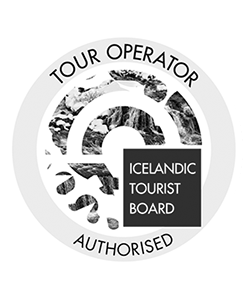 Please be sure to add pick up to your booking if you are not planning on meeting us in Landmannalaugar for the tour. 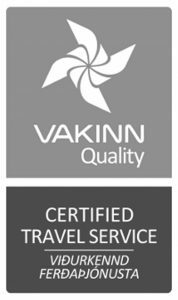 If you plan to meet us in Landmannalaugar then please keep in mind that you will need a 4*4 jeep that is permitted on F-roads to drive to Landmannalaugar. 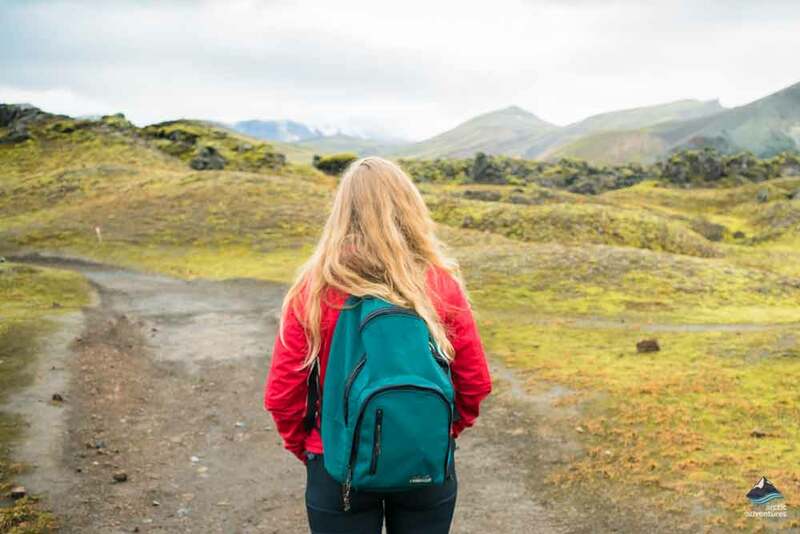 Your hiking adventure will start from the main hut in Landmannalaugar and take off for about four-hours where you will hike around this gorgeous place. 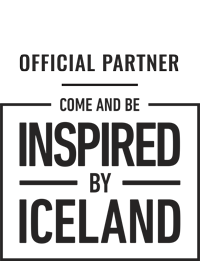 The total hiking distance is approximately 8-10 km. The route goes over Laugahraun lava field, through Vondugil canyon and up to Mt. Brennisteinsalda a multicolored peak that is highly characteristic of the area. 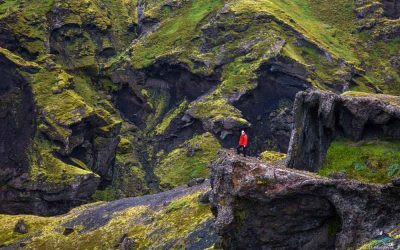 On the way down you will walk down Graenagil gorge, called Green Gorge in Icelandic because of the dominant green color of rhyolite in the area. 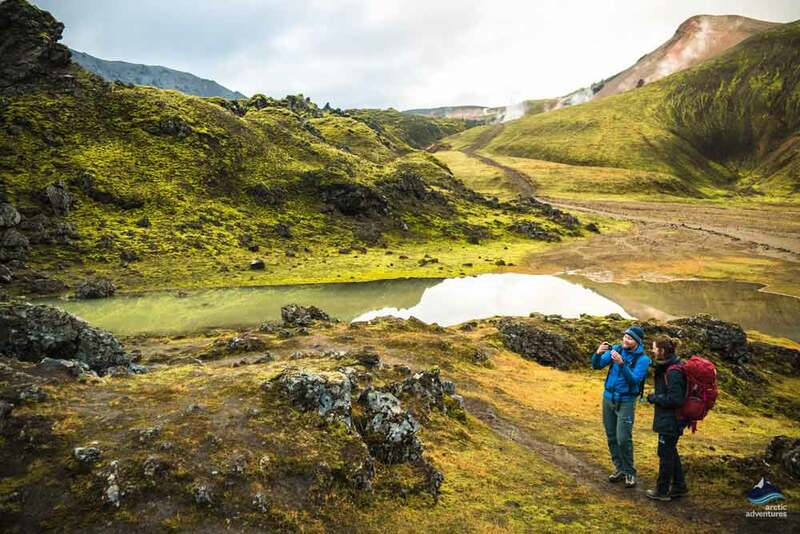 If time allows, we will summit Blahnukur Volcano before soaking in the hot pool in Landmannalaugar and take in the spectacular surroundings of this phenomenal place! Remember to bring: It is extremely important to have warm outdoor clothing, waterproof jacket & pants, headwear and gloves. Good hiking shoes are essential on this tour. Sturdy hiking shoes, waterproof jacket, and pants can be rented beforehand if you contact us or book online. Last but not least, don’t forget your bathing suit and towel! Meet us at 12:00 pm in front of the Main Hut in Landmannalaugar – Please keep in mind that you need a 4*4 jeep that is permitted to drive on F-roads to drive to Landmannalaugar. 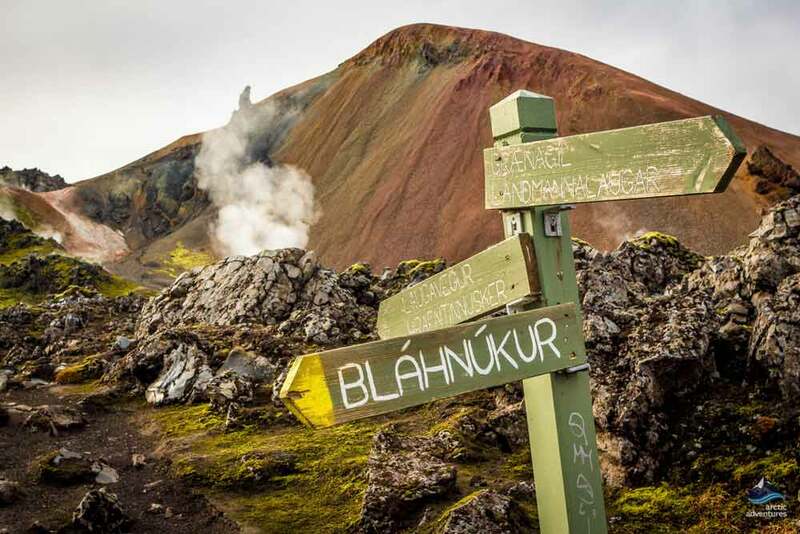 I would like to meet the group in Landmannalaugar - what kind of vehicle will I need? You will need a 4*4 jeep to drive the roads to Landmannalaugar. These are rough F-roads and many car rental companies don’t allow you to drive on these roads so be sure to contact them beforehand to make sure it is permitted. These roads take longer to drive so make sure you allow for plenty of time. If you arrive before the group then you are in luck, enjoy the scenery and breathe the fresh highland air – you wont regret spending some extra time in this beautiful area! 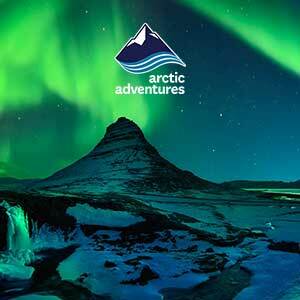 Brilliant day had with artic adventures. Both tour guides were informative and sound. Our day tour guide was Inga and she was great. The hike wasn’t too strenuous but unless you have proper gear renting boots and waterproofs is required. It was raining and snowing and the luminous orange overalls I got were more than handy. We also got to bathe in the natural hotspring at the base camp which was handy after the hike! The journey from Reykjavik is about 3.5 hours each way so if I was to go again I would do the multi day tour but for a day trip it is still worth the travelling times as most of it is through the highlands!